Have you ever been so focused, going a mile a minute, almost in a race against time, when something manages to catch the corner of your eye and suddenly you are pulled from your course and the entire machine grinds to a sudden and abrupt halt? For me, the machine was my fervent dedication to the Centre (CARE). Every moment, every energy, every thought was wrestled away from myself and given to the animals. Non stop. 100%. 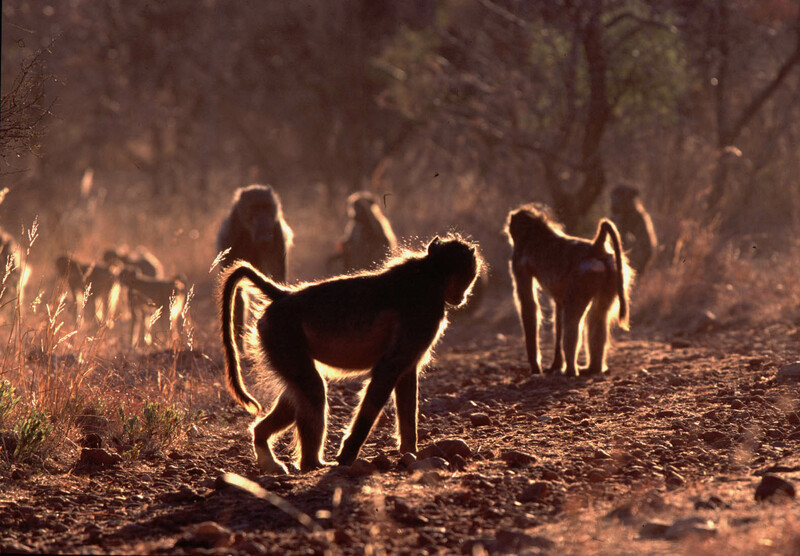 Eat, Sleep: for Baboons. Released CARE baboons. Photo by Attie Gerber. On this memorable day, I found myself pulled out of my normal routine. I needed to go to town to extend my return flight (again). To add to the unusualness of the day, I also found myself free of any orphaned infants and with enough time to shower before leaving. Opportunities for me to get out of the bush and into civilization arose very infrequently as I usually had a young orphan under my care. If I HAD to go and couldn’t leave my baby at the center I’d often try to hide him or her under a jacket and hope he/she/they didn’t wake up and try to climb out at an inopportune moment – like at the register. Sleeping monkeys are WAY easier to hide. The problem with people seeing me with a baby baboon was that 1) it drew a lot of attention which could be distressing to the baboon, 2) I wasn’t able to explain to everyone who saw me WHY I had a baby baboon and that it was NOT a pet, and 3) this meant that I may have inadvertently been promoting the idea that having a primate as a pet was an acceptable and desirable thing to do. The last time I’d gone into town was an experience I didn’t care to ever repeat. I’d been approached near the end of the day by the much-adored, though highly cantankerous director of the center, Rita Miljo, a septuagenarian German ex-pat with uncompromising dedication to the well-being of animals in general and baboons in particular. I had no idea I was going anywhere and thus quickly delegated my remaining duties and climbed in the bakkie (pickup truck) without much thought. As I started down the corridor of the Phalaborwa Mall making my way to the travel agency I noticed a man that was walking toward me jerk backward as if startled. I looked to see what he was reacting to and was startled myself when I realised he was looking straight at me. With his brow furrowed and nose scrunched up, he looked me up and down and proceeded to move away from me. It was then that I looked down and realised that what may pass as acceptable clothing in a baboon center in the middle of the bush does NOT pass among normal human circles. My clothes were saturated and stained with dirt and a potpourri of offending baboon evacuations. Much as a fish packer no longer smells the fish on him until he shows up at a fancy dinner party, I had lost my awareness of myself. I walked down the corridor wearing the shoes of a social pariah as the crowd parted before me maintaining a radius traversed only by unidirectional shots of disgust. Determined to not relive that, I ran up the hill midday to take my shower. As I ran, I relished the forgotten freedom in each and every stride that was not possible with a baby in one’s arms. Were it not a foolish idea, I probably would have done a cartwheel to express my exuberance. I burst into the room that I shared, throwing my clothes off in a flash! Oh the simple pleasures we take for granted! 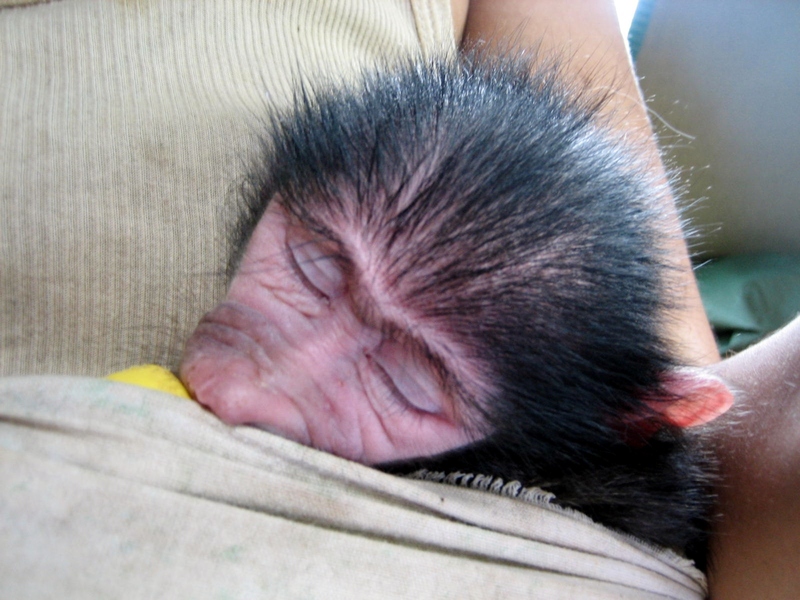 Clinging baboon infants necessitate the utmost tact in the removal of clothing so as not to upset them. There is no carelessness allowed. Then the shower… Oh to have two hands to clean the body with! No slippery, wet, cranky infant to juggle with one hand while trying to clean sufficiently with the other! And then the drying off… oh that was glorious too. So simple. Just me. 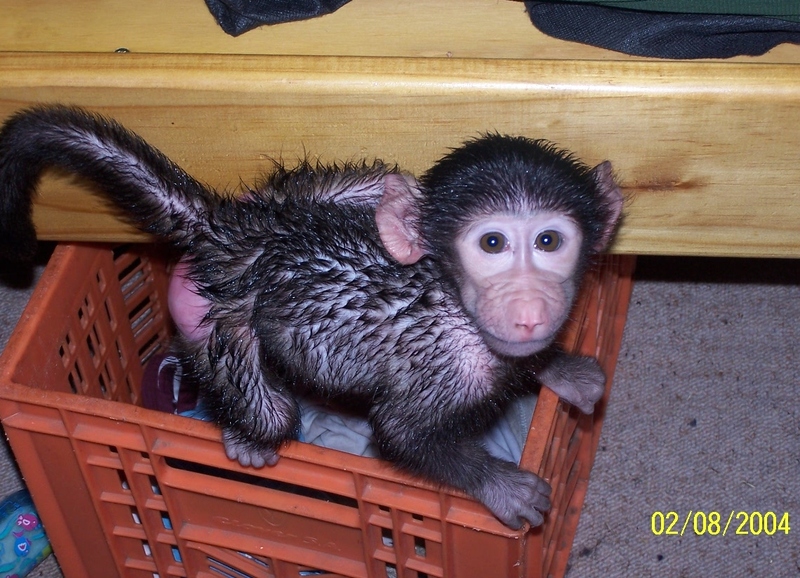 Elliot was TERRIFIED of the towel.Soaking wet, baby monkey fleeing around the room... What else do monkeys do when they are scared? They "eliminate". Instead of my usual routine of climbing into my clothes as quickly as possible (while still being partly wet) in the most absurd of positions so as to reduce the amount of infant upset, I did something different: I hung up my towel and strolled out of the bathroom conjoined with my room – naked. I realized there was no mad rush today. I had a few minutes extra. And no one else was around. I stood for a moment and simply enjoyed my nakedness. This was something I had never experienced here before. I walked over to my bureau intent on pulling out my “nice” clothes that hadn’t been worn in too long to remember. I found my clothes and shut the door. It was at that moment that my consciousness of everything else around me fell away and time suddenly stretched to a halt. I froze, staring at the unexpected image of what seemed to be a stranger. Reflected before me in the wardrobe mirror that I had forgotten was even there was a form that was only vaguely familiar to me. I stared, transfixed while I felt my brain stretch far back, searching its memory in order to make sense of what was before me. Slowly, as I scanned first with my eyes and then traced with my hands I realized that the stomach, hips, thighs and breasts… were mine. This was my own body and yet I did not recognize it! But how could this be? How could my body have changed so much without me even knowing it? How could I have been startled by my own image? I searched for an answer and was stunned when I finally found it: I had not seen my own reflection in almost a year. This entry was posted in Uncategorized and tagged africa, baboon, CARE, monkey, sanctuary, shower. Bookmark the permalink. Wow, what a crazy realization that must have been! I imagine it would be incredibly freeing, to not be focused on a single aspect of your appearance for a year. I doubt I’ve ever gone a single day without seeing my reflection. The concept is intriguing, to say the least. But I have to admit, I’m having a hard time focusing on the bigger meaning of your post with all the freakin’ adorable baby baboon pictures! WOW! !